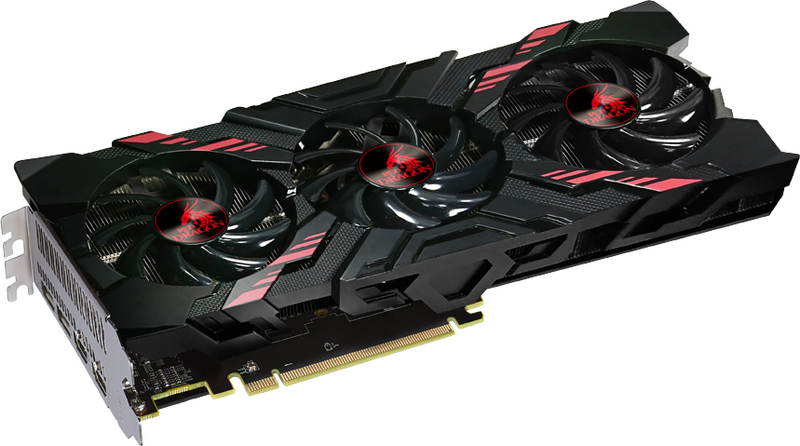 PowerColor has released its new graphics adapter based on AMD’s Radeon RX Vega 56 GPU and paired with its own custom PCB. The new Red Dragon RX Vega 56 is based on a rather tiny PCB that it would fit easily into Mini-ITX builds, but ships with a massive triple-fan cooling system that only fits into enthusiast-class PC cases. PowerColor says that the Red Dragon RX Vega 56 (AXRX VEGA 56 8GBHBM2-2D2HD/OC) video card was designed to make the cost of the board lower without sacrificing performance or reliability. Unlike its Red Devil RX Vega 56 and Red Devil RX 64 brothers, the Red Dragon RX Vega 56 comes on a short PCB and does not offer factory overclocking. Meanwhile, just like more advanced boards, the new graphics card has a BIOS switch for flipping between different performance modes (silent & overclocking). Furthermore, the card has one 8-pin and one 6-pin auxiliary PCIe power connectors, which should be enough even for those who plan to run it at higher frequencies. As for connectivity, the Red Dragon RX Vega 56 has two DisplayPort 1.4 and two HDMI 2.0b outputs. 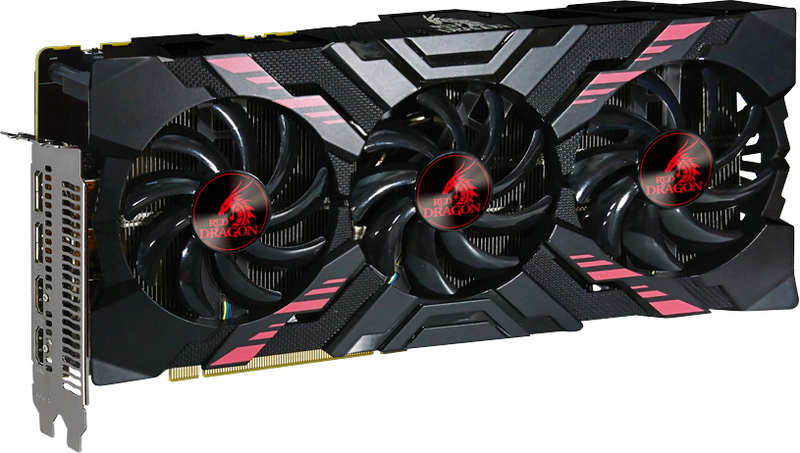 The Red Dragon RX Vega 56 comes with a large cooling system featuring a copper base, multiple thick heat pipes and three fans. The cooler is two slots wide and 316 mm long, which makes dimensions of the whole construction similar to other graphics adapters based on the Radeon RX Vega. Meanwhile, since the card relies on a short PCB, this potentially opens the door to some aftermarket options; in particular switching out to something more compact (say, a hybrid LCS) in a bid to fit the board into an SFF PC. Obviously, this is something that PowerColor does not recommend doing, but if you want to have a Mini-ITX gaming PC with a Radeon RX Vega inside, buying a custom graphics card and then switching its cooler is the only way to build such a system at present. The short PCB is probably a bit simpler and cheaper than the long one used for the Red Devil RX Vega boards, which gives the manufacturer some additional flexibility when it comes to pricing of the product. Meanwhile, the shorter and simpler PCB does not necessarily mean that the new graphics adapter has compromises. AMD’s reference design for the Radeon RX Vega uses a 6+1 phase VRM based on the International Rectifier IR35217 power controller with six IR 3598 phase doublers for the GPU power circuity to maximize efficiency. The Red Devil Radeon RX graphics cards use exactly the same VRM as reference cards do, but while it is unclear what is under the hood of the Red Dragon RX Vega 56, it is unlikely that PowerColor sacrificed efficiency for a bit lower BOM cost on a high end product (i.e., the VRM is good enough and it is unlikely that the GPU VRM has less than six phases). PowerColor says that the Red Dragon RX Vega 56 will be available shortly. 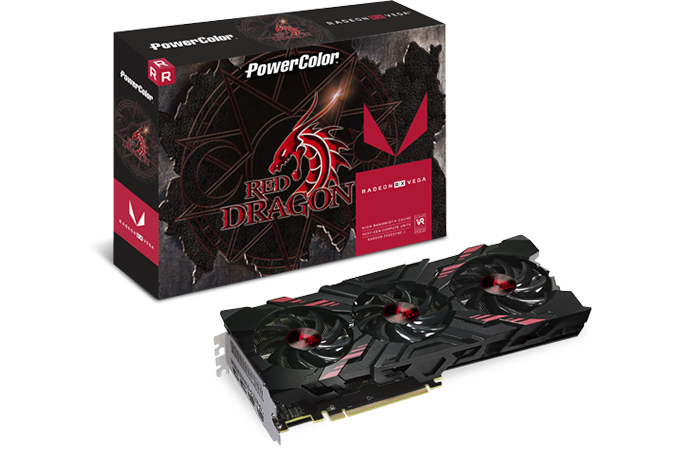 When it comes to pricing, the Red Dragon sits below the Red Devil lineup, so expect the new card to cost less than the higher-end products from PowerColor powered by the same GPU. Haha WOW. I didn't even notice that. Whats the point of a 3rd fan with what appears to be nothing below it? less expensive for them to produce is "good" but the fact that as soon as it hits store shelves price goes through roof is bad..vega 56 ~$1k vega 64 ~$1.2k not bad for cards that should be costing $399-$699 the makers and AMD/Nv say they do not see this amount of extra "gain" someone sure as hell does and is laughing all the way to the bank.